Net neutrality is not dead; it’s not even dying. Bureaucrats and lobbyists picked a fight with the internet but, by the time we’re done, they’re going to wish they hadn’t. The Federal Communication Commission’s repeal of net neutrality hasn’t yet gone into effect, but Washington state just became the first state to enact its own strong law ensuring an open internet despite an onslaught of telecom lobbyists armed with misleading talking points. The bill soared through the state legislature with overwhelming bipartisan support. Dozens of other states are considering similar bills, while several governors have issued executive orders in defiance of the FCC. The news out of Washington state comes just hours after major tech companies like Etsy and Kickstarter announced that they’re joining public interest groups and taking the FCC to court to fight for net neutrality. If successful, these lawsuits would force the FCC to reverse its decision and restore protections that prevent internet service providers like Verizon, Comcast and AT&T from controlling what we can see and do online with censorship, speed-throttling and new fees to access content. There will be nothing to stop these near-monopolies from engaging in censorship, blocking online services because they’re deemed “politically incorrect” or charging extra fees just to access the sites we use every day. Net neutrality supporters have a good chance of winning in court: Ajit Pai, the former Verizon lawyer now in charge of the FCC, blatantly ignored the voices of tech experts — and millions of people from across the political spectrum — and instead based his rulemaking almost entirely on debunked studies funded by the telecom industry. His agency was also caught ignoring serious issues of fraud with the agency’s public comment process, despite the fact that 98 percent of the unique comments submitted opposed his plan. But big ISPs have plenty of money to spend on expensive lawyers, so litigation could take years to play out. In the meantime, internet users and small businesses could be left without any net neutrality protections in as little as two months. And, without rules to prevent abuse, ISPs would have the power to decide where you get your news, how you listen to music and stream video and which apps you use. There will be nothing to stop these near-monopolies from engaging in censorship, blocking online services because they’re deemed “politically incorrect” or charging extra fees just to access the sites we use every day. Think they’d never do this? They already have: Major players have been documented throttling users' connections when they chose a rival gaming service, prevented pro-choice text messages and even blocking tethering and FaceTime. Major players have been documented throttling users' connections when they chose a rival gaming service, prevented pro-choice text messages and even blocking tethering and FaceTime. Meanwhile, the largest internet companies, like Facebook and Google, will gain even more power to manipulate the free flow of information, as they’ll be able afford to pay the likes of Comcast and Verizon for access to their customers, squashing competition from startups who can't afford to do the same. Fortunately, the overwhelming backlash to the FCC’s decision is having an impact in Washington D.C. as well. Last week, in the midst of another massive internet-wide day of action, the Senate and House both introduced Congressional Review Act resolutions which, if passed, would completely overturn Ajit Pai’s order and reinstate the legal framework for basic net neutrality principles. Net neutrality is too important to the future of free expression and democracy to give up now. The ISPs have come up with a clever opposition plan, calling for legislation that claims to save the internet, while undermining the core principles of net neutrality by gutting the FCC’s ability to prevent abuse and leaving the door open for harmful paid prioritization scams. Some lawmakers are heading in this direction, but even the best-intentioned of these bills is likely doomed. because, unlike a CRA, traditional legislation would require 60 votes in the Senate. That’s not going to happen in this Congress. If the CRA on this issue passes in the Senate, it will be a huge victory for the public and a humiliating defeat for Ajit Pai and his lobbyist friends. Then we’ll take the fight to the House of Representatives, where we’ll have to to flip about 25 Republicans to hit the 218 votes needed to win. Finally, the CRA would have to go to the White House to be signed. No one can predict what will happen there but even GOP FCC Commissioner O’Rielly told Politico that he was unsure whether Trump would veto the CRA if Republicans started to support it. Getting the CRA resolutions passed won’t be easy but, if internet users come together to fight, victory is well within reach. As Washington state just showed, net neutrality is not a partisan issue outside of Washington D.C. More than 83 percent of voters from across the political spectrum, including three out of four Republicans, oppose the FCC’s plan to hand cable companies control of the Internet. 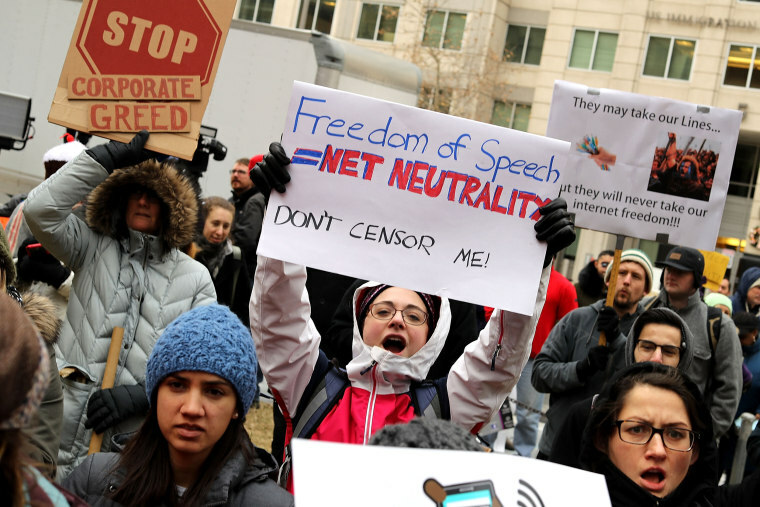 So there’s no time to mourn: Net neutrality is too important to the future of free expression and democracy to give up now. We can’t just advocate for it, we have to win the fight. Evan Greer is a queer parent, activist, and musician based in Boston. She's the deputy director of Fight for the Future, and writes regularly for The Guardian, Newsweek and HuffPost. Evan Greer is a transgender parent, activist and musician based in Boston. She's the deputy director of Fight for the Future, the group behind the viral net neutrality action site BattleForTheNet.com, and writes regularly for outlets like The Guardian, Newsweek and Washington Post.